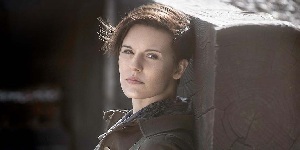 Welcome to Maggie Grace Fan, the latest online resource dedicated to the talented actress Maggie Grace. Maggie has been in movies such as "The Fog", "Taken (2 & 3)", "The Twilight Saga Breaking Dawn - Part 1 & 2" and "The Hurricane Heist". She has also been in TV shows like "Lost" & "Californication" and she's currently playing Althea in AMC's "Fear the Walking Dead". This site is online to show our support to the actress Maggie Grace, as well as giving her fans a chance to get the latest news and images. Here are the first 2 stills from Maggie in the first episode of Fear the Walking Dead’s season 5. Maggie and the rest of the FTWD season 5 cast attended the Wondercon Fear the Walking Dead Panel yesterday, 31 March. Click on the link below to see all photos from Wondercon. AMC announced today from WonderCon that Fear the Walking Dead Season 5 and the highly-anticipated supernatural horror series NOS4A2 will premiere back-to-back on Sunday, June 2 at 9:00pm ET/8:00pm CT and 10:00pm ET/9:00pm CT, respectively. In addition, subscribers to AMC Premiere, AMC’s premium upgrade option, will have an opportunity to binge the entire season of 10 episodes beginning Sunday, June 2. I added 7 new HQ photos to the gallery taken by photographer Matt Jones in 2006. Click on the link below to see the full photoshoot. Fans of Fear the Walking Dead should shamble on over to the Arena at 12:30PM, for a panel with cast members Lennie James, Alycia Debnam-Carey, Colman Domingo, Danay Garcia, Maggie Grace, Garret Dillahunt, and Jenna Elfman. Maggie, and the rest of the FTWD season 5 cast, attended the SXSW 2019 Twitter For ‘Fear the Walking Dead’ event on March 9. I added 13 new HQ photos to the gallery, outtakes from Virtuoso Life Magazine, taken in 2016. Fear the Walking Dead is an American horror television drama companion series of AMC’s original The Walking Dead series. Based on the comic series of the same name by Robert Kirkman, Tony Moore, and Charlie Adlard, Fear the Walking Dead is set in the initial outset of the walking dead virus, with the executive producers being Kirkman, Gale Anne Hurd and David Alpert.